For this week’s book review, let’s look at a book I’ve borrowed. Well, borrowed isn’t the word. Had given to me unbidden. I have been reading the first Wheel of Time book and so expected not to read this for a while, however, as I had great difficulty getting going with that book and I figured this would be a quick easy read I decided to try this. It certainly is a quick read, and one that is both hard to put down and hard to want to keep reading. 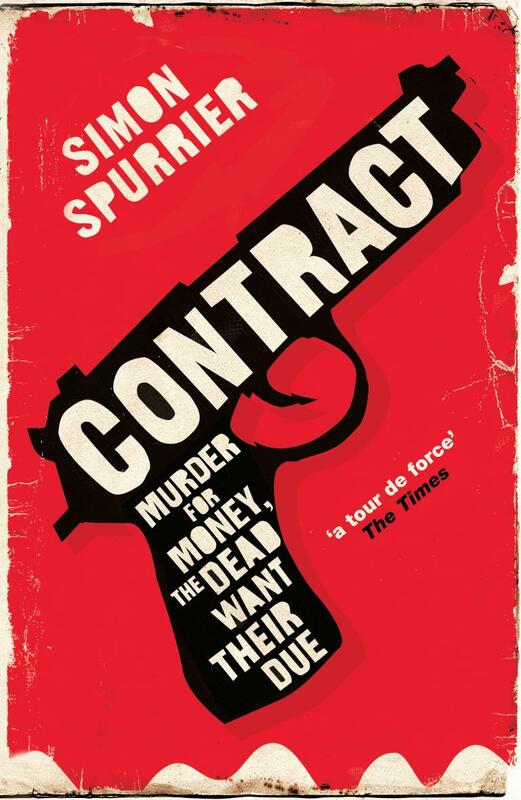 Contract is a post-modern crime novel with a supernatural twist. Mostly told in the words of the main character, Contract certainly has its own style. And an annoying repetitive style it is. I mean it’s, like, got a verbal hiccup. I mean it’s, like, got a trick where it repeats a sentence opening. I mean it’s, like, got to do it over and over. And that’s just one of the tricks used throughout the book. Most annoying and repetitive, some effectively subverted later in the book, some just annoying all though. The sentence opening one, I had particular issues with, as I’ve always had issues keeping my place in a paragraph and so have a automatic reaction to re-reading the same bit twice that took me out of the book. But that’s just me. This unique quirk of the main character shared with a secondary character for no apparent reason (and I looked for one). And that was a problem with some of the tricks. Some were hidden: his “the job’s done” code phrase relating to his past is never rammed home it’s just there. So does that mean that the use of “think” instead of “thing” that one time was a clever pun, a momentary reflection of the character being remarked on’s word usage or just a typo. I ponder this while reading the next couple of pages and realised I wasn’t concentrating on the book. The style reads almost like a prose version of Bruce Dawe’s Enter Without So Much As Knocking, a poem I loved in High School, but annoying in book length. A lot of the repetitive, annoying, boring stuff is set up to be just that (at one point the character advices the reader to skip over the next bit) so the later subversion works. But that doesn’t stop it being repetitive, annoying and boring. The book also falls for the post-modern trope in modern crime fiction of being down on Hollywood to show “this is real”, but as usually happens falls into the exact same tropes (but invokes the “it’s OK, it’s ironic” trope.) Our hero tells us how much he doesn’t care about just working away, about one-job-too-many as he shows he really cares, can’t walk away and does what is clearly one-job-too-many. Of course, the hard, shallow, unfeeling outer-shell is broken down and we are left with the character’s inner nothing. Usually there’s a least an uninteresting character under the shell, not just nada. All of the twists were obvious and unsurprising and the fact that the character taking a chapter or more not understanding the twist (while claiming he’s not quick, he’s not clever over and over) didn’t made it an exercise in frustration. Yes, the character didn’t have all the information we had (even though most of it was from his POV) and as claimed, wasn’t quick or clever, but did have to wallow in not understanding. He was narrating after the fact, damn it. There was in the jumbled train-of-thought narrative and the tangents and the return to tangents distracting from the pacing, although the bad-US-documentary recapitulation upon each return grated. Like most post-modern smarter-than-Hollywood crime fiction constantly telling us how much smarter it is doesn’t make it so. No matter how often he repeats that no one in this business has ever been caught for being too cautious, being too cautious is often exactly the reason that people in his business are caught. But also like most post-modern smarter-then-Hollywood crime fiction there’s something compelling about it. Something alluring about the voice of the character – no matter how annoying – something attractive about waiting for the next twist and turn – no matter how obvious. Planet of the Apes: Tales From the Forbidden Zone.